1. Hourglass Veil powder : It’s official – I can never tell the difference between setting powders. They all seem the same to me! I don’t use any setting powder all over my face – just under my eyes to set my concealer. So, this is fine. But it works just like any of my others. 2. 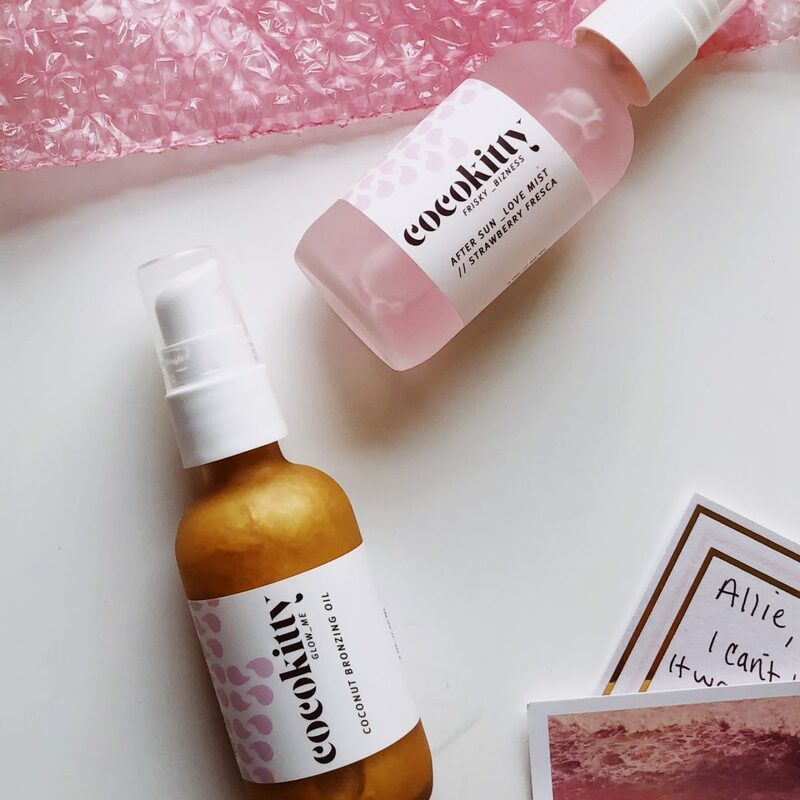 Cocokitty Coconut Bronzing Oil and Strawberry Fresca Mist : I set the mist on the counter in our bathroom and I found myself misting my face on days I worked from home. I haven’t used the coconut bronzing oil since I got it but I think it’s because 1) I haven’t been wearing any tops that really show off my shoulders and 2) I would feel like I needed to shower off before going to bed in case it rubs off. I’ll give it a shot soon. 3. Volition Beauty’s Prismatic SPF : I found myself never reaching for this but not because it’s “bad.” I just never wear a separate SPF outside of it being in my foundation or tinted moisturizer. I moisturize my face, apply an eye cream, then a primer and then my makeup (on days I wear a full face of makeup). On days I wouldn’t wear makeup, I would either want to sit in the sun for 10 minutes to get some Vitamin D (and then cover my face) or not be in the sun at all. I think it’s just a routine thing for me. 4. Fenty’s Match Stix Trio : I have worn some combination of these 3 sticks every day since I got it! I absolutely love a light makeup look with this. I’ll use the light colored stick to correct any darkness under my eye, slightly bronze with the darker stick and use the highlight, too! I was even sick one day and someone said I still looked nice and glowy. 5. Tatcha’s The Silk Canvas primer : I’m not convinced that this is the bee’s knees yet. I’m not sure if it’s because I don’t use a super full coverage foundation or because I’m never needing my makeup to last a long time. I don’t find it helping with filling in my pores much. And it’s pretty big. I traveled with it and felt like it took up a lot of room. 6. Urban Decay’s Naked Skin Concealer in light warm : This is the perfect shade for me. I love it! 7. Ouai’s All The Ouai Up Kit : In my typical fashion, I haven’t used these AT ALL. I never use hair products and need to just remember to use it this week. It’s fully summer now (and hot) so I’m just wearing a top knot every day. RIP any cute hairstyle until fall.